As my regular readers know, it's normally about this time of year that I start declaring my crazy intentions to blog from A to Z throughout April, usually with a theme, vague (2014) or specific (2015)! This year I still haven't decided whether or not I can commit to the month, life is pretty crazy and April doesn't get any easier... I'd set myself an arbitary goal of "If I can get some posts written and a theme chosen and ready for the 21st March Theme Reveal I will!" I know I can't wait to read these! As for me, I think it's going to be a decision I make on the 31st March - I may well be the last blog on the list if I do sign up! 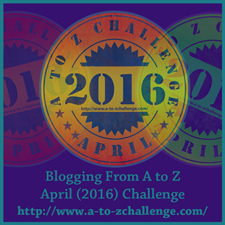 Will you be reading or writing any of the A to Z Bloggers this year? I feel bad that I don't think I'll be able to visit all of the A to Z blogs. I'm trying to come up with a way to visit new ones and also keep up with a few of the ones that I've discovered just over the last few days since the theme reveal. I love how varied the themes are! I keep a folder of bookmarks on my main bookmark bar of blogs I visit. I start on the list under my own blog and work down, then revisit ones I enjoy and of course visit back anyone who visits my blog... after a week or so it tends to get more random in the list with new ones and I often blog hop from others comments on other A to Z blogs! But having the folder of everyone you've visited and commented on means you've got a record of how many, it's surprising how quickly it can add up. Last year I did more visits but on less blogs, but there were quite a few I followed for the whole challenge. Hey congrats on being a minion, fab news! Yes, I do really want to, one of the nicest things about the A to Z is meeting all the other bloggers and discovering things you never knew. I'm promised myself I'd make a decision after this weekend, I had a go at writing some posts but I still haven't made a decision... I'm not sure what I'm writing works in that regard... got a feeling this is going to be a right to the wire decision!